I'm not just learning academically. I'm getting life skills that will stay with me forever. It's an amazing feeling. 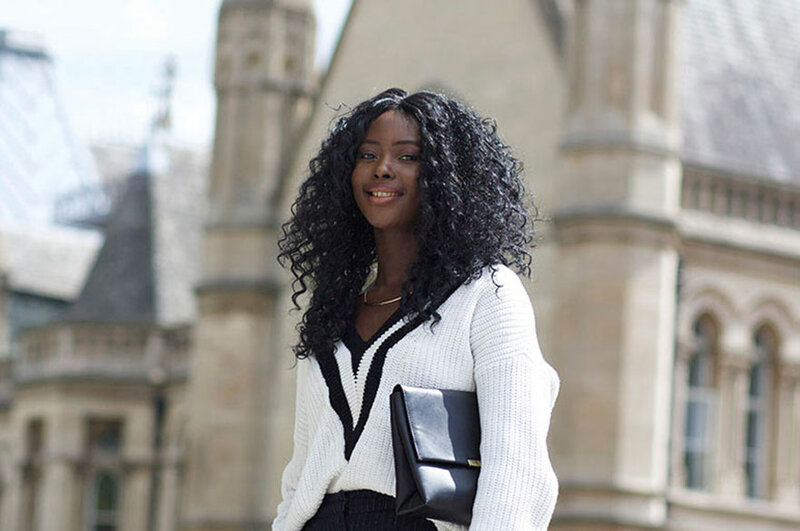 "Originally from Nigeria, I grew up in France and later moved to the UK to study. Before coming to Nottingham Trent University (NTU) I studied business management at college. I was looking for a course that could combine fashion and business so the BA (Hons) Fashion Marketing and Branding course was exactly what I was looking for. "The favourite part of my experience so far is the course itself - I'm even enjoying the assessments! They allow us to really show our creativity and understanding of different projects during the year. One of my favourites was creating a brand book for a French company called Ladurée. I like the practical side of the course and it helps me to understand a lot more what I would like to do in the future. I really enjoy every aspect of my course and I would recommend it to everyone who is passionate about the subject. "The School of Art & Design enables creative people to work together and network, which is essential in this industry. I have a fashion blog called Fashion by Daisy. My colleagues in the photography department help me shoot and we all learned from each other. My blog is an expression of my passion and has a growing readership, which is very exciting. "Studying in England is very different from studying in Paris and much better, in my opinion. While students in France are in lectures every day from 9 am until 5 pm, studying here is more flexible and independent. I have time for my social life and extracurricular activities that help me balance my student life. It means that I'm not only learning academically but I feel like I'm learning about myself and getting life skills that will stay with me forever. "Nottingham as a place is a great city for international students. It is so easy to find your way around, especially during Welcome Week when student ambassadors are everywhere, ready to answer your questions and give you directions. Nottingham is a true student city – it's a real community here. It has great nightlife, restaurants from around the world and a lot of cafes to meet with your friends and relax. When I first visited I fell in love with it. The City Campus is right in the heart of Nottingham and it was easy to picture myself studying and living here for the next few years. "My best advice would be to choose wisely what you want to study. It's important you do something that you are passionate about and make the most of your time here. Also, get involved in the Welcome Week activities as it's the best way to meet people and make friends. It helped me realise that I'm not alone and everyone else is in the same boat; coming from all over the world, starting a new chapter in life and doing it independently. It's an amazing feeling."